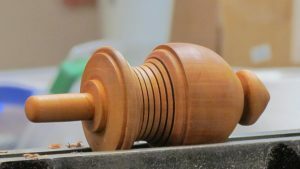 Bruce Wood – In a Spin | South Auckland Woodturners Guild Inc.
South Auckland Woodturners Guild Inc. 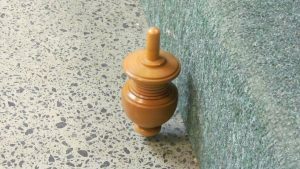 The efficient spinning top: String full driven and provided with actual measurements. 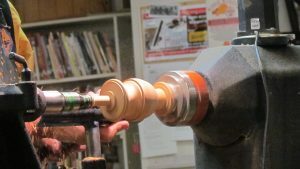 Bruce’s demo was a spindle turning top based on the standard woodblock 70 mm x 70 mm x 180 mm. The wood is set between two centres before the attack. 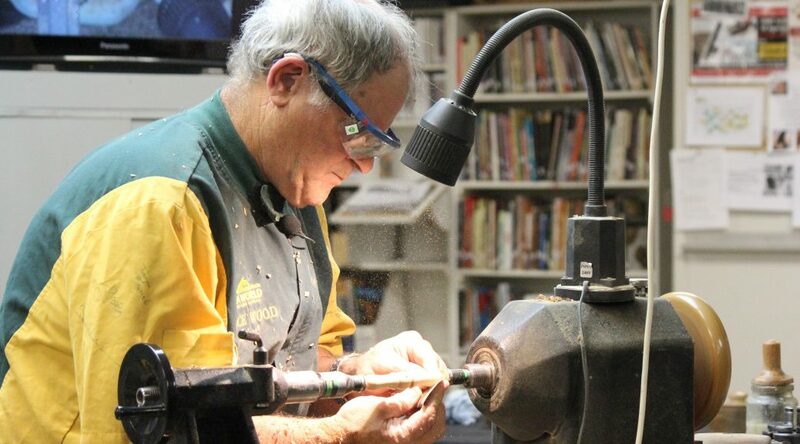 Bruce quickly changes the square into a cylinder with a measured spigot on the end. Tip 1: Watch the sharp tips on your Vernier callipers. Slightly rounded tips allow for a lot more safety on fingers. Tip 2: When putting the chuck on, wind on with the headstock in until tight, then use the mechanisms provided. Tip 3: There are lots of lovely tools for getting the dead centre. And, there is much ease in using a spring-loaded awl for making the mark. Planning is always an emphasis, starting with drilling a 4.5 mm whole on one end. The hole in this case was 40 mm long or twice the distance needed. Again the mantra of Bruce: measure. Then measure again. And then, check the plan. The three part main body is measured off and worked, all the time being checked, for sealing and sanded. A good tidy with the skew chisel cuts down on sanding. 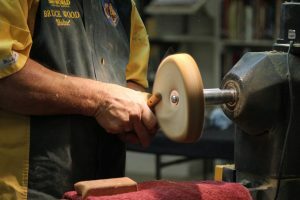 When the spin drive of the main body is completed, work on defining bead and following Cove for both looks and finish. The bottom section is tapered off slowly and the piece overall, believe it or not, conforms to Fibonacci. Tip 4: Use the spindle gouge in an underhold style. This saves on fingers. Tip 5: Sanding sealer cuts down the final effort and provides a good base for either the finishing lacquer or the Beale polishing system. Turn the main piece around on the lathe and fit into pen jaws. This allows for the finishing of the pointy end. Care needs to be taken with the 4.5 mm hole at the end measurement. Again, to check that the final depth is correct. Bruce used wood 40 mm x 40 mm x 180 mm. Pre-drilling the holes for the top base and string outlets are best done when the wood is still square. The diameter of the straight round holes allow the fit of the top of the base top. The diameter of the oval holes allow for easy insert of string and the pulling to get the top going. These holes are in the top 1/8 of the length of this section. This section is kept square. The rest of the handle is turned to make a good holding handle. Most of the work being done for looks rather than functional utility. It has to be said that Bruce’s beads and Cove sections make for a better looking handle. Bruce tidy handiwork does get the beads and coves even and good-looking. In and turning language this means a lot of fiddly turning for finishing off. The edges of the square section are slightly rounded with gentle sanding. This removes most of the sharp edges. More turning between centres. A cylinder around 25 mm in diameter is tidied up, beaded and coved (looks) and gently sanded off for finish. Again, there is significant advantage in drilling the string hole while the piece is still square. Tips 6: Drilling the hole on the square form for the string first is quite useful. Tips 7: An initial dose of sanding sealer allows for a quicker and cleaner finishing and polishing. Tip 8: Remember, a too heavy or too fast sanding with mechanical tools can leave a mark on the timber. Slowly and with soft hands avoids this issue. 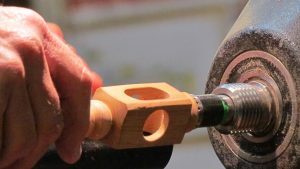 There are many options for taking off the buds at each end of the string handle; penknife, small Japanese saw, power saw poor some form of mechanical sanding. The nail on the base, one of the final steps, can be rounded off by holding it in a Jacobs chuck on the drive before insertion into the base body.